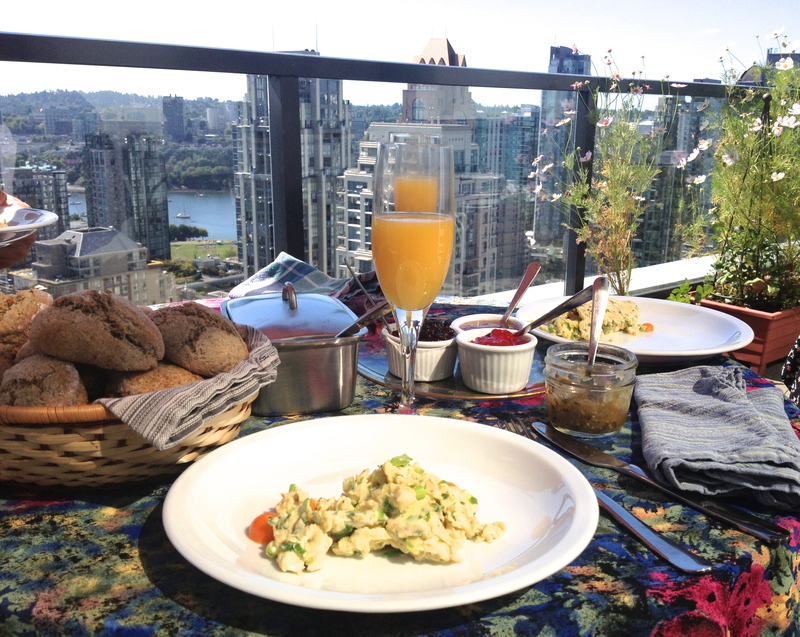 This morning, I met up with my stranger of the day at her breathtaking 26th floor Yaletown apartment home. 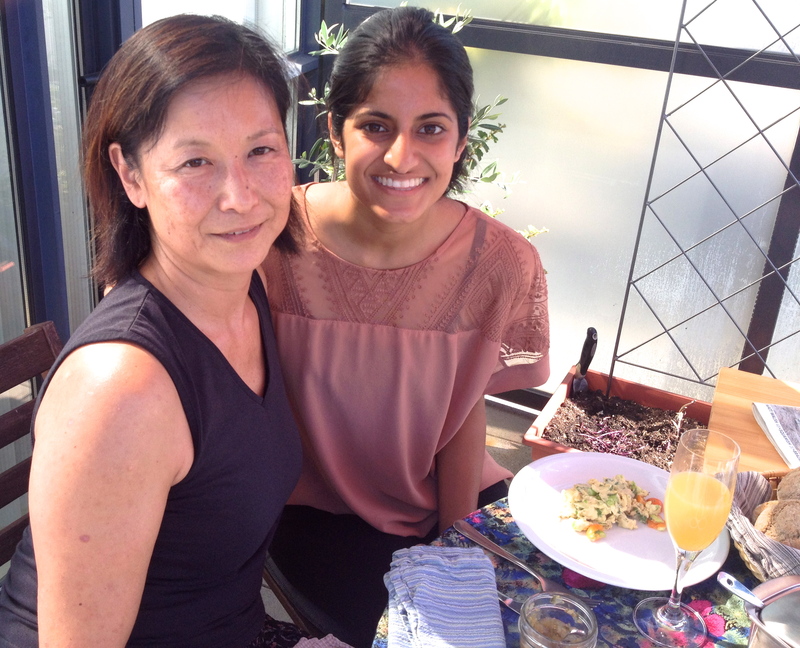 She’s a professional chef by career, so it only made sense that we spend our time cooking brunch together while I got to know a little bit about her and what she loves. Her name is Karen and she is a remarkably kind, generous, resilient, and talented woman. It’s an honour to be able to share her story. Background behind how we met: I mentioned in my post on Day 4 that I was fortunate to exchange contact information with a bunch of really interesting strangers after giving them my elevator pitch last month at the Creative Mornings event. I said that I would love to meet with each of them over what was then the next 97 days, over coffee or tea (or brunch). Karen gave me her card and now, after a few back-and-forth e-mails and a delicious Sunday brunch, we are strangers no longer. I’m still in awe of how kind she is to have invited me into her home. She greeted me at the door and as I stepped foot into her apartment, I was instantly captivated by her beautiful kitchen, balcony garden, and view of the city. She had already prepared and measured our ingredients. 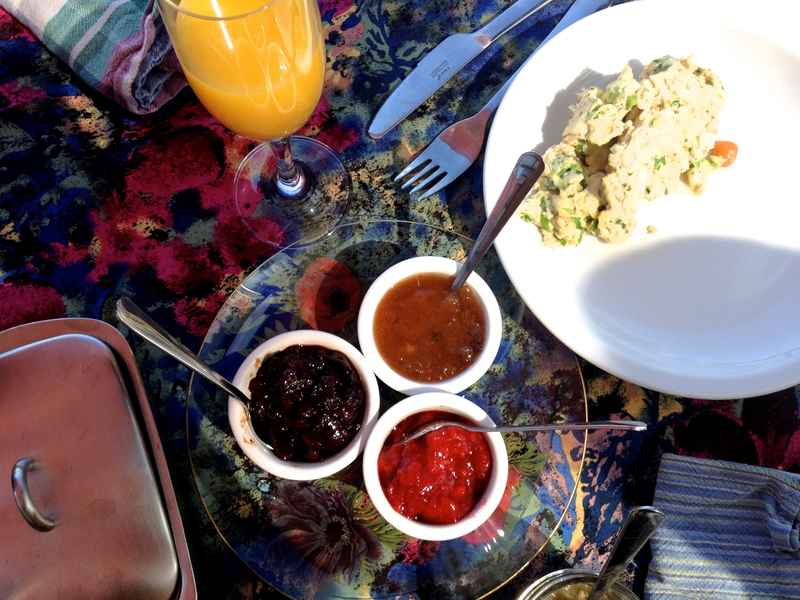 The menu: homemade scones and jam, scrambled eggs, mimosas, and coffee. Karen has been cooking for forty five years, of which only the last five have been in a professional capacity. She’s excellent. We mixed the ingredients together carefully. 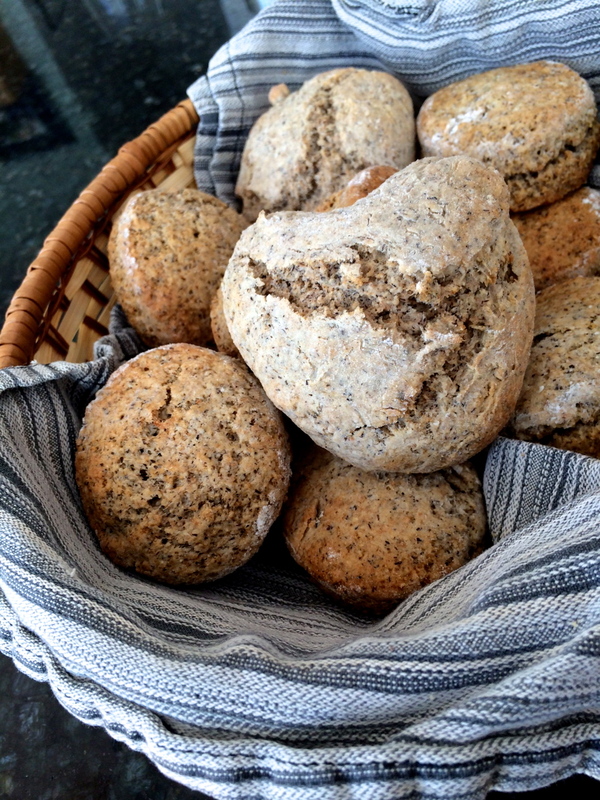 As I was cutting the shapes for the scones, she noticed I was standing very stiffly, rigid in my movements. “Aliya, you can move around, you know?”, she said, smiling. I explained that I’m not the greatest chef and she said something that I thought was very wise: “A lot of people who don’t think they can cook have had an experience in the kitchen where they tried to make something, and it didn’t come out as they’d planned”. She assured me that even as a professional chef, she still experiences the same thing every now and then. It’s expected. It’s practically inevitable. And it doesn’t have to be a bad thing. “Besides”, she continued, “cooking isn’t exactly intuitive”. It takes practice. She has many years under her belt. Her experience exposed itself in the flavours. The scrambled eggs were the best I’d ever tasted. We added a dash of roasted garlic sea salt from the Pacific Ocean (courtesy of the Vancouver Island Salt Company), accompanied by some parsley, green onions and grape tomatoes straight from her garden. As we sat on the balcony eating the scones of our labour, Karen told me about her story. She was born in Vancouver, and both of her parents were born in Canada as well. She and her mom were actually born in the exact same hospital. She studied metallurgical and chemical engineering at the British Columbia Institute of Technology. Although culinary science is a little bit different from engineering, she still sees it as a very scientifically methodological practice. In fact, when we were egg-scrambling she explained to me the science behind the metals in the pan. I’m always inspired by people like Karen who are true experts in their areas of passion, deeply knowledgeable of the intricacies and quirks of their trade. “Forty was a traumatic year for me”, she said, telling me about the year her thirties came to an end. “I decided to dye my hair blue”, she said, pointing to the tablecloth to show me exactly which shade. Her hairdresser was very conservative, and wasn’t a huge supporter of Karen’s choice of colour. Nonetheless, she dyed her hair with streaks of blue. But to her dismay, the blue ended up taking on a much lighter shade than she had expected. It looked like she had streaks of grey hair! 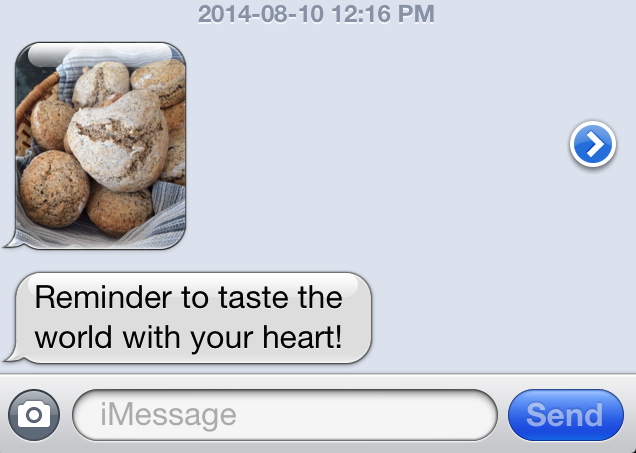 This, of course, had the opposite effect of what she’d anticipated. “It was traumatic”, she said, her eyes wide, then interrupting herself with an honest smile upon second thought “–well, it wasn’t trauma, it was vanity”. During Karen’s fortieth year, something truly traumatic happened in her life. Her husband had a heart attack in the middle of the night and passed away. Her life turned completely upside down, and everything changed. “It was really traumatic”, she told me. I was stunned by her resilience, seeing the life she has created for herself, living with her second husband, the mother of two incredibly accomplished daughters, living her passions, and about to be a grandmother. She told me about how this loss allowed her the space and time and reflection to completely change her perspectives. She explained that although the situation was miles and miles away from being ideal, she wouldn’t be where she is today if it hadn’t happened. It was a hard time for her and her family, especially because her kids were so young. But she got through it and acted as a true role model for her kids in her strength and resilience. In Karen’s free time, she loves watching plays and musicals, savouring the sounds of live music, traveling, and volunteering. She was taught at a young age the importance of volunteerism. She has served on the board of the Sharing Farm Society, along with a music-themed summer camp for girls, and the Jazz festival for many years. In addition to cooking, she teaches the practice of food preservation. She makes exquisite jams and salsas. And you can (and should) find out more about her and her amazing services here. I love the way you described my dear friend and helped me to see her in new ways and adore her even more! Thank you. Thank you, Jacqui! I’m glad you enjoyed the read. Karen was really fun to write about!